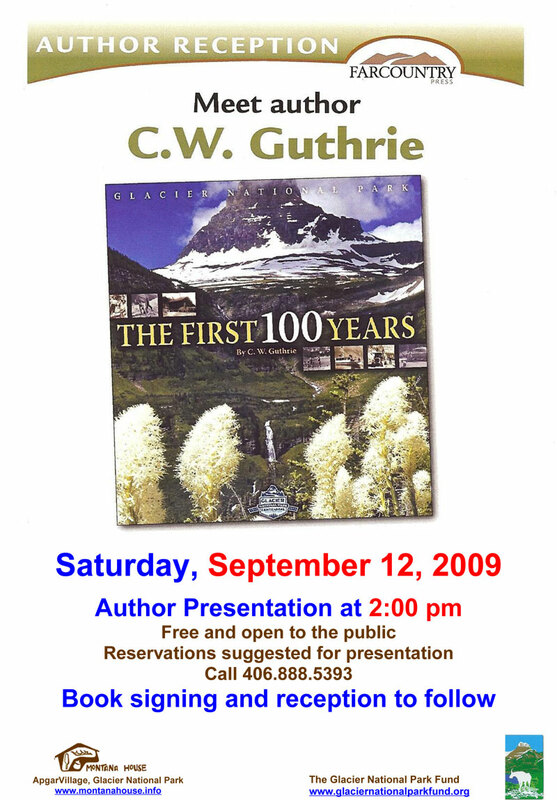 The Montana House Regional Gift Shop in Apgar Village and The Glacier National Park fund are pleased to host C. W. Guthrie on Saturday, September 12, 2009 at 2:00 pm. 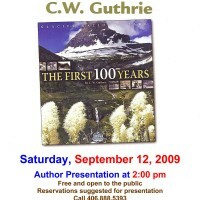 Carol will talk about the writing efforts that went into her latest book – Glacier National Park, The First 100 Years. She turns back the clock to times when massive glaciers covered the area we now know as Glacier National Park, to the time when several Native American tribes called the Crown of the Continent home, to the collision of cultures with the rush of settlers moving west and to the astonishing changes that have taken place in the Park since it’s inception in 1910. Carol will speak at 2:00 pm with a book signing and reception to follow. This event is open to the public with no cost to attend, but it is recommended to call 888-5393 for reservations, as seating is limited. Her new book is available for purchase at the Montana House. C. W. Guthrie is a freelance writer who lives in the Ninemile Valley west of Missoula, Montana, with her husband, retire test pilot Joe Guthrie. She has written four other books about Glacier National Park: The First Ranger: Adventures of a Pioneer Forest Ranger – Glacier Country, 1902 to 1910; Glacier National Park: Legends and Lore Along Going-to-the-Sun Road; All Aboard for Glacier, the Great Northern Railway and Glacier National Park; and Going-to-the-Sun Road, Glacier National Park’s Highway to the Sky. Hans and Toni Jungster established The Montana House Regional Craft Shop in 1960 at Apgar Village just inside Glacier National Park. Their daughter, Monica, and staff continue to carry on their mission to celebrate and promote the creativity of Montana artists and craftsmen along with the rebirth of Native American artistry. Montana House has also been a long-time avid supporter of the Park. For further information call 406-888-5393 or send your inquires to 1960mthouse@centurytel.net.